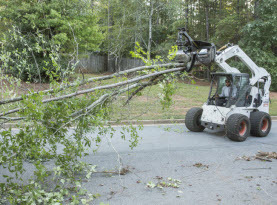 The knowledgeable experts at Milam’s Tree Service provide professional tree trimming and pruning as well as tree and stump removal and other related services for homes and businesses in McDonough, GA. Our tree service technicians have extensive experience with local trees and terrain and are available to take expert care of the trees planted in your yard. There are many native trees found in the state of Georgia but what could be more southern than the rich sweet fragrance of the Magnolia tree. Magnolia Trees are especially well known for their large flowering blooms of white, pink, purple, red, and yellow. The shape of the leaves vary and they are available in both evergreen and deciduous varieties. 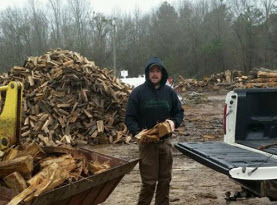 According to the experts at Milam’s Tree Service, one of the most important things to consider when planting Magnolia trees is to select your plant site carefully. Once a magnolia is established it is extremely hard to move to another site as plants can be extensively damaged by digging around the root bulb. Choose soil that is rich, well drained and neutral to slightly acidic in nature. As a general rule, magnolia trees require large amounts of organic matter during the planting phase. Tree’s should never be crowded and often look their best when planted alone. Magnolia trees make excellent lawn trees with nothing planted under them. Magnolia acuminata (Cucumber-tree) – This species of magnolia tree is named after its fruit which resembles a cucumber. The tree can reach a height and spread of 50 to 80 feet. The tree is fast growing with wide branches and prefers full sun or partial shade. The extremely fragrant green white flowers bloom in spring and will turn yellow bronze during the fall months. Magnolia macrophylla Michx. (Bigleaf Magnolia) – This species of magnolia certainly lives up to its name with its large waxy leaves that range in size from 20 to 30 inches. The tree can reach a height of 40 feet with a spread of 15 feet. The fruit is large and resembles cones, while the flowers are white and fragrant. Growth is slow with a straight trunk. Bigleaf magnolia is an ornamental tree which prefers full sun or partial shade. Magnolia pyramidata Bartr. (Pyramid Magnolia) – This deciduous tree grows up to 30 feet in height and has a spread of 25 feet. Its leaves are eight to 10 inches long which perfectly offset its fragrant three to five inch long white blooms. It has a high heat tolerance and thin grey/brown bark. Magnolia tripetala (Umbrella Magnolia) – True to its name, the umbrella magnolia has large diamond shaped leaves that are one to two foot in length. It can grow to 40 feet in height with a spread of 20 to 30 feet providing an excellent canopy. The cone shaped fruit matures in August through September and is pollinated by beetles. The umbrella magnolia prefers partial shade to full shade and is not tolerant to conditions of drought. Magnolia virginiana L. (Sweetbay Magnolia) – The sweetbay magnolia is a slow-growing evergreen tree that can grow between 50 to 100 feet. The tree produces magnificent white blooms from April to July with red fruit from July to October. The sweetbay performs best in part shade and makes a beautiful addition to any landscape. 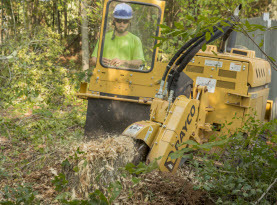 For more information regarding tree trimming & pruning, stump grinding & removal, emergency tree removals, storm damage clean-up, firewood and more. 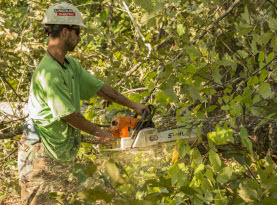 contact the experienced professionals at Milam’s Tree Service today.